This handsome buck has been sitting in my drafts folder since January, patiently waiting for the day I would find him and share him. Well, today is that day — mainly because the WSJ reminded me of him over the weekend. 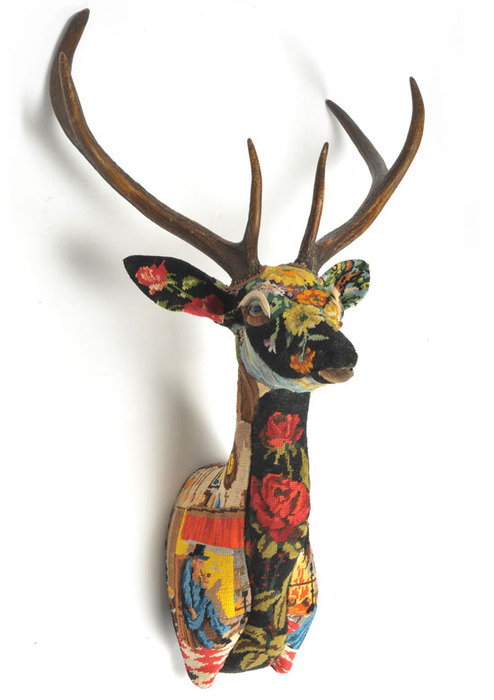 Artist Frédérique Morrel and husband Aaron Levin are at the helm of this quirky design firm that deals mainly in tapestries and antique fabric remnants, with an inclination towards faux-taxidermy (of deer, bulls, rabbits, and people) (yes, people), seating and interesting tabletop accents. Good lord. I need this in my life. As usual your taste is impeccable. Maybe we can buy him together and share? You are currently reading Quite Continental Loves: Frédérique Morrel at Quite Continental.